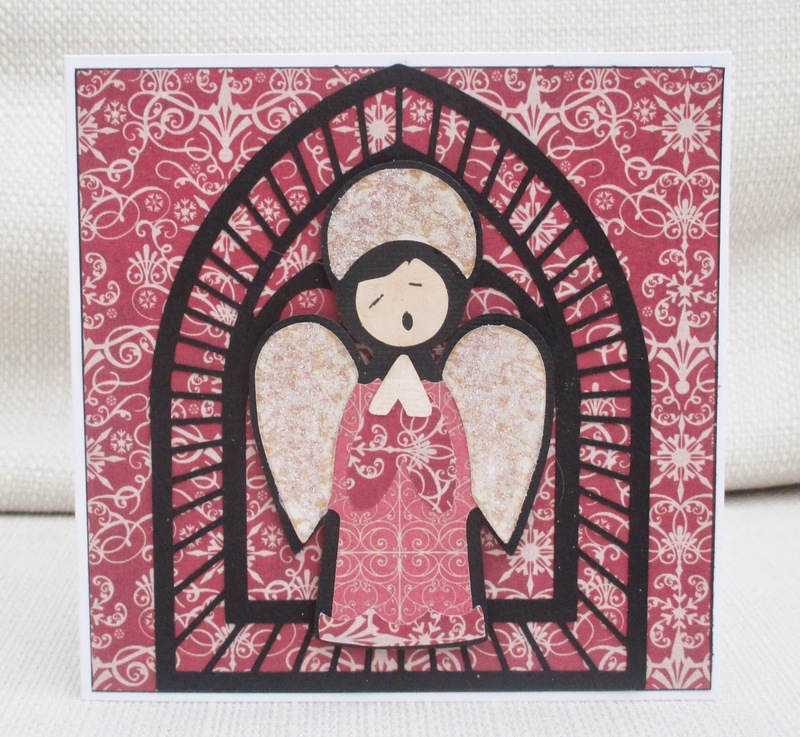 Here's a CAS Christmas card , using a Paper Artsy angel, masked and overstamped with Kaisercraft grid stamp. I added a stamped sentiment and 3 square gems. Sounds like a five minute make doesn't it? I don't know where the time goes when I'm crafting! Red Rubber Inspirationals stay focused on stamping. Ah, dear Reader, the fortuitous collision of a day off, and the delivery of some newly purchased stamps! 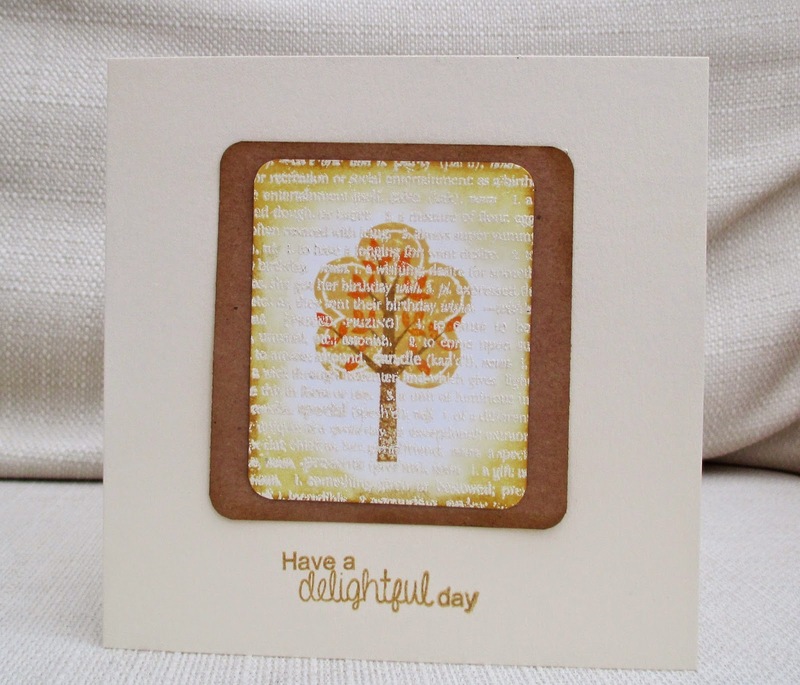 This card was made using the Design a Tree set from Clearly Besotted stamps, a background text stamp from Hero Arts, and lots of Distress inks. I thought I'd take a rest from Christmas cards and join in some non- Christmas (or Halloween!) challenges. 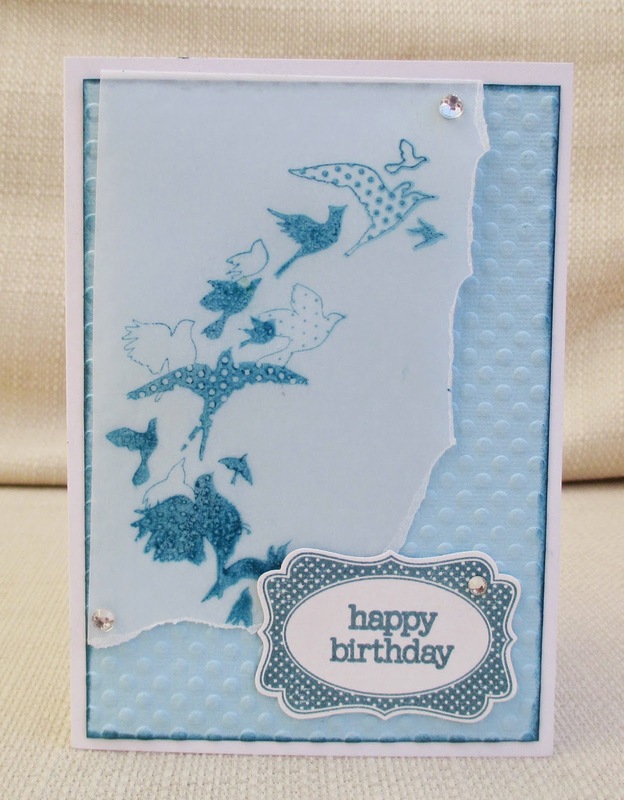 The theme for this card was set by Time Out - 'birds of a feather flock together' . I didn't have to think too long before I remembered this stamp but it took me ages to find it! (Note to self: must downsize craft stash!). The spots on the birds made me remember I'd seen a 'dots' challenge at Love to Scrap. 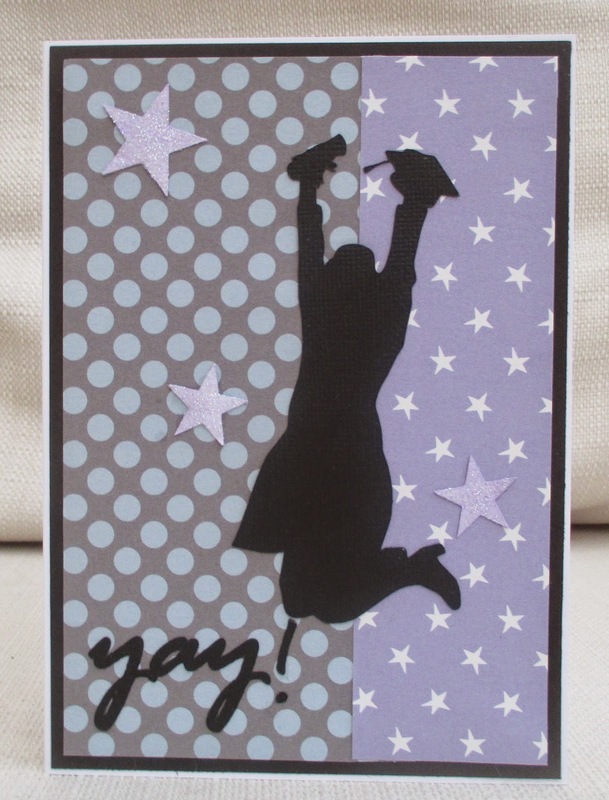 I carried the theme through with a spotty embossing folder and a spotty label stamp (Stampin Up) , which I punched out and stamped a sentiment in (Sarah Hurley). You may notice I haven't credited the brand of the birds stamp. That's because the packaging has long gone. Which brings me to the 'Shop in Your Craft Room ' challenge at Simply Create Too . All the stuff I've mentioned is old stuff, as is the vellum I stamped the birds on, which has been gathering dust for a while now. I've made quite a few Christmas cards lately, in addition to my 'one a week' commitment, so I will upload a few over the next few days. This one is made from a pre-coloured image from Dollar Graphics Depot - I printed it , cut it out and inked it, layered it on papers and stamped the sentiment. I have a few more of these images that I'll be making into cards later on. 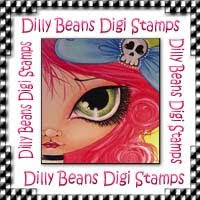 I used a digi , kindly provided by sponsor Dilly Beans , to make a CAS card for a child. I coloured the images with Promarkers, paper pieced the clothes and added a doodled frame. The sentiment and paper are by Basic Grey. I hope you'll come and join us at Pinspirational, where there are great prizes to be won. Our challenge this week at Make My Monday is 'Shabby Chic' and I hope my card hasn't got too much shabby and not enough chic! I used some patterned paper for the background , layered with some corrugated cardboard that I painted white. I stamped a die-cut butterfly and a sentiment ( Paper Artsy) and added a pin, pearls and flowers. We'd love to see your shabby chic projects at Make My Monday. Inkspirational Challenge 68 - Owls Photo. So I didn't go for a highly original interpretation but I like owls! 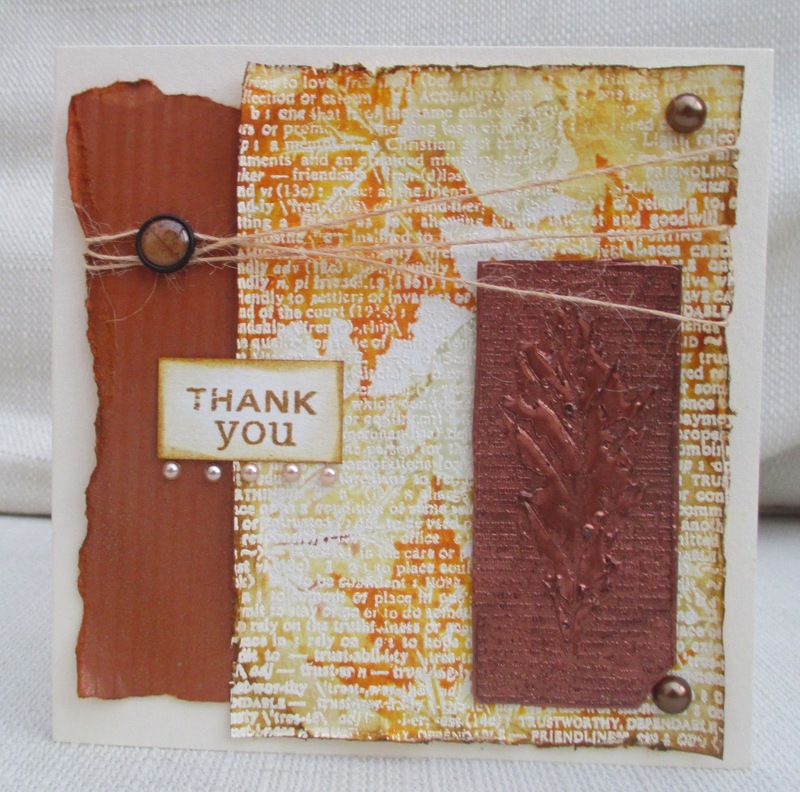 Although the card is overwhelmingly orange, I used a range of distress inks on it. 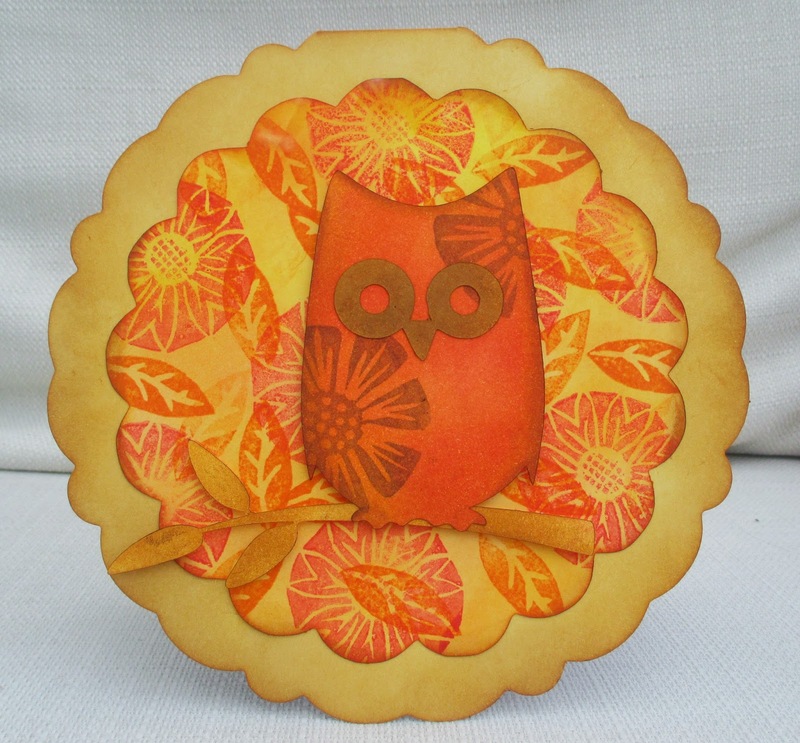 The owl and branch were cut on my electronic die cutter and I stamped flowers and leaves by Paper Artsy. 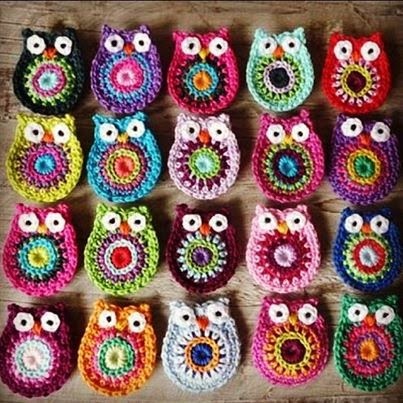 The circular shape card and the circular flowers are supposed to reflect the crocheted circles on the owls. I hope you will come over to Inkspirational and join in. We have a wonderful Guest Designer, Maura and great inspiration from the rest of the DT, so I'll see you there. Use Your Stuff Pet - Okay, I don't have an owl (or any pet) but both Harry Potter and Florence Nightingale did. White on white can be hard to photograph, so I hope you can spot the tree and reindeer in the blizzard. Crafty Hazelnuts Christmas something forgotten/unused - the background embossing folder was found when I was a rummaging for a different one - I can't even remember when I bought it! Stepping up the Christmas card making now! 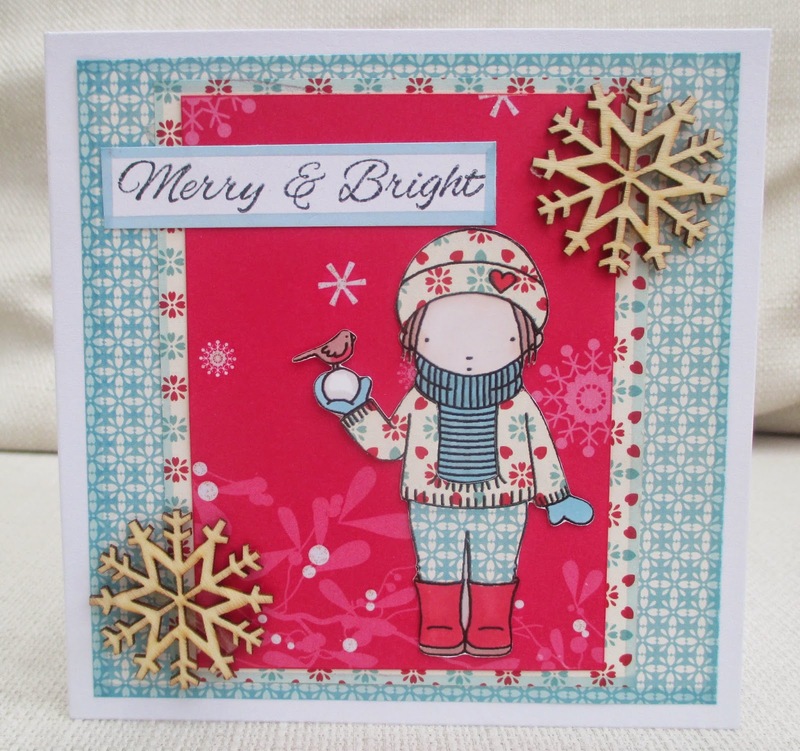 I was inspired by a card by Tracey Metcalfe in the November issue of Making Cards (pg 79, if you've got it). However, I used quite different materials and methods to get a similar look. The background is alcohol inks and I stamped two triangular Hero Arts trees with green acrylic paint. 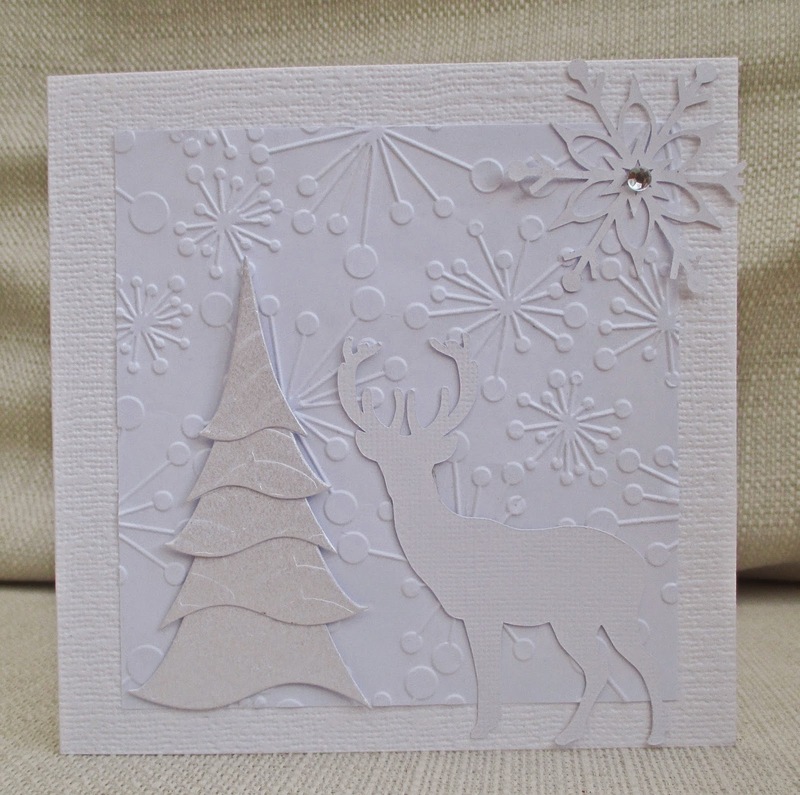 Then I stamped the 'snow' with white ink and a Bo Bunny distressed dots stamp, and embossed it with glittery embossing powder. 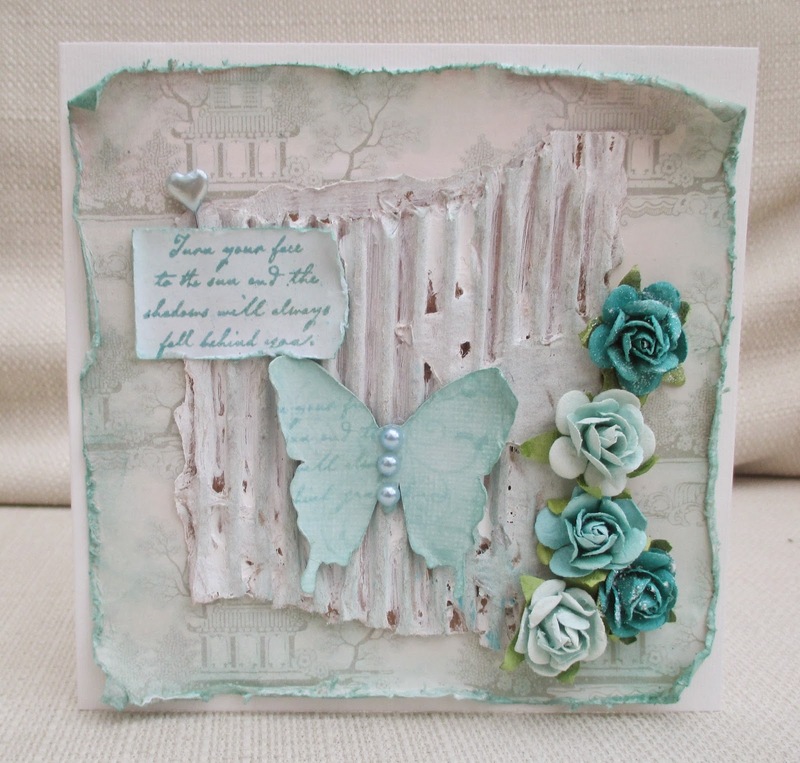 It's time for another challenge at Creative Cutting Challenges and it's 'anything goes' . 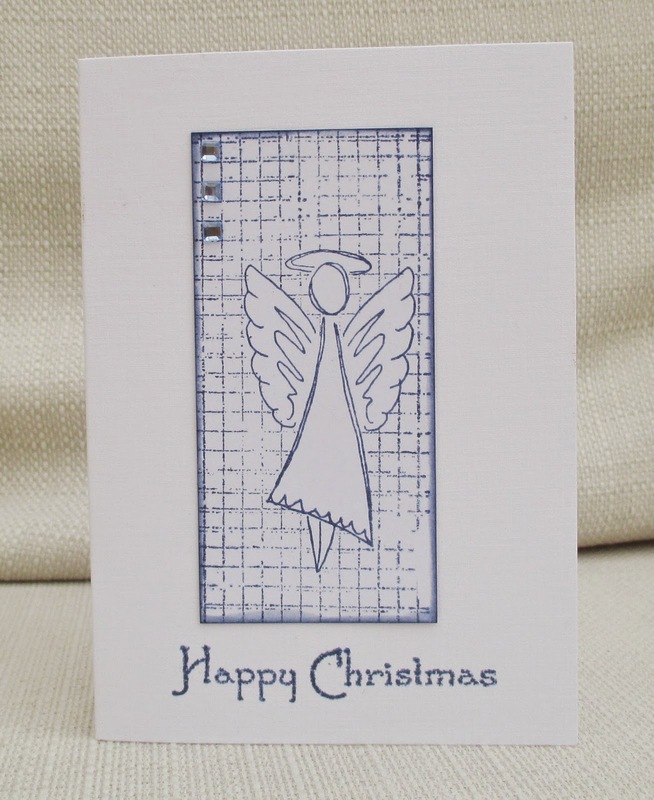 I made a Christmas card featuring an angel svg from The Creative Pointe. Unfortunately the photo doesn't show that the wings and halo are encrusted with glitter. Behind the angel I placed an arched window by Monica. We'd love you to join our challenge at Creative Cutting - all you need to do is use an SVG or similar electronic cutting file and tell us what you've used. See you there. This week at Make My Monday our challenge is Halloween. For my DT card I used a digi called 'the dark forest' by Delicious Doodles , and I coloured it using purple, green and yellow Distress Inks. The witch and bats are a cutting file by Valerie Wilson. 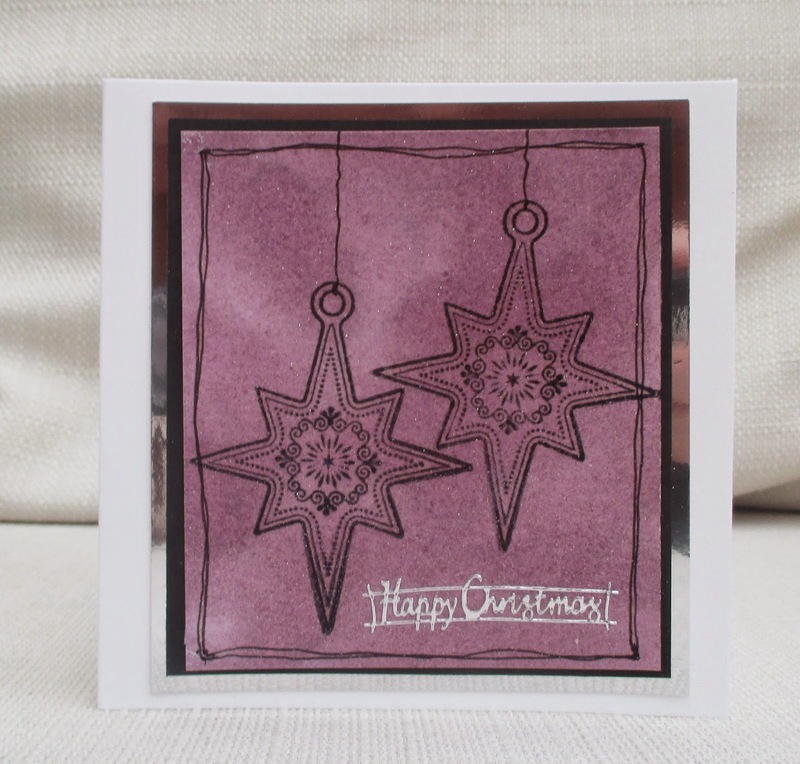 I embossed the purple card and sanded it. 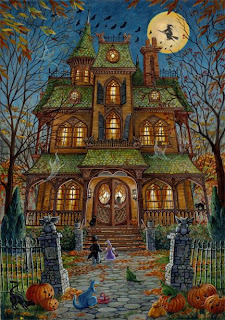 Please come and share your spooky creations at Make My Monday. Do you notice anything about my title today? Yes it is week FORTY of 48! Only eight more weeks before I need to write in the cards and send them off - which , perversely, I don't really enjoy. I much prefer making them! This week's card is a decoupage scene, for which I used a decoupage set from Papermania Christmas CD , and I've pretty much used it as it came, just adding glitter, glitter paper and a sentiment. 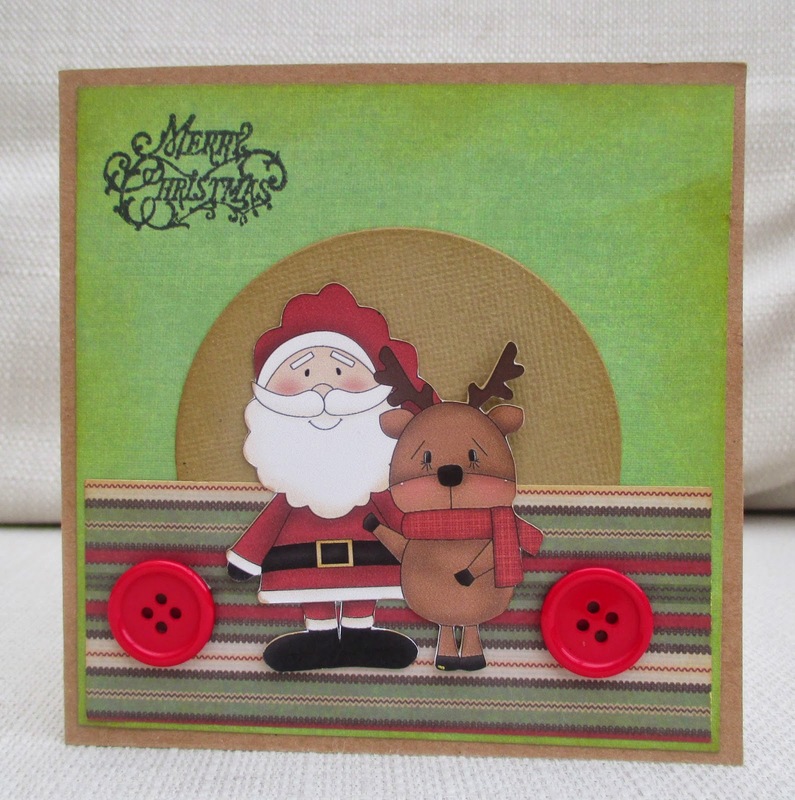 It's my pleasure today to be one of the Guest Designers at Scrapping 4 Fun, for their 'anything goes' challenge. My daughter asked me to make a graduation card for her friend. The terrifying thing is , as my daughter is graduating at the same time, I will have to think of another idea (bigger and better!) for my daughter's grad card! 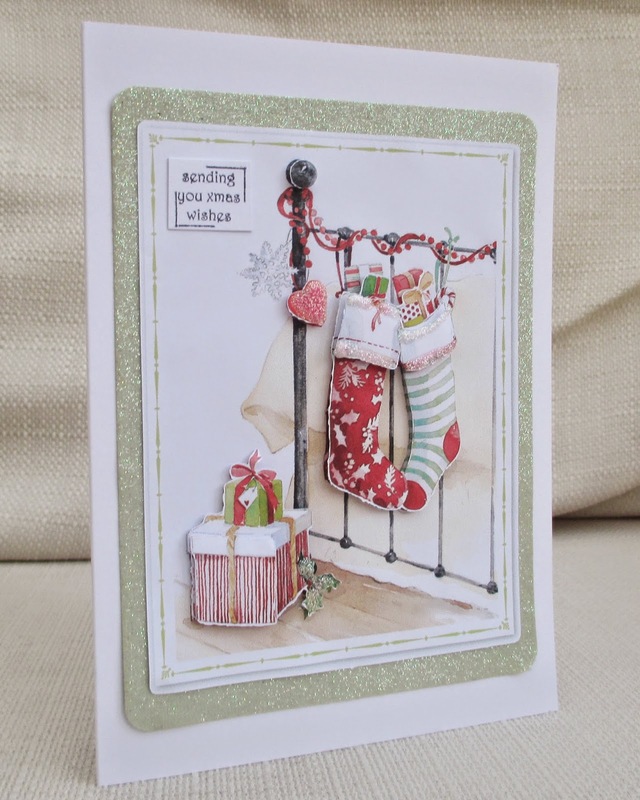 I hope you will join in with the challenge at Scrapping 4 Fun . 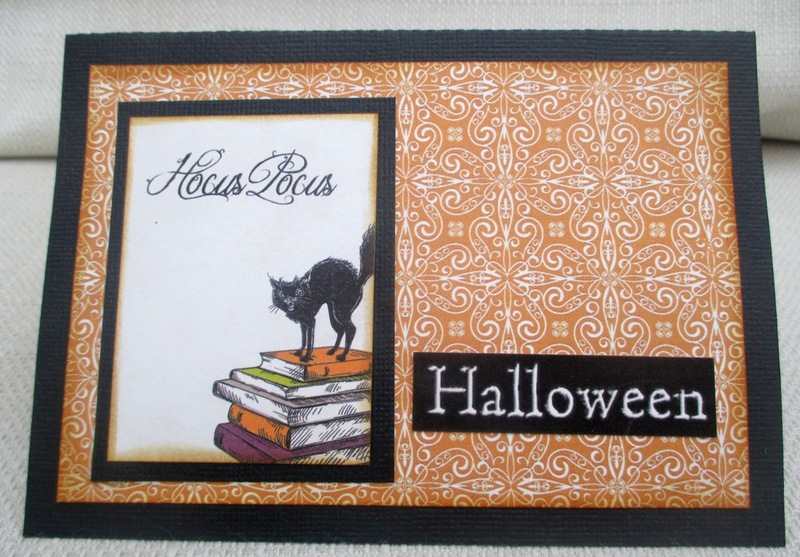 At first glance, this might look like I've used Halloween papers - I don't know why I combined orange with black, as this is a birthday card and in fact, the papers are from a 'school' theme range. This is my DT card for Make My Monday , where the theme this week is 'Numbers'. 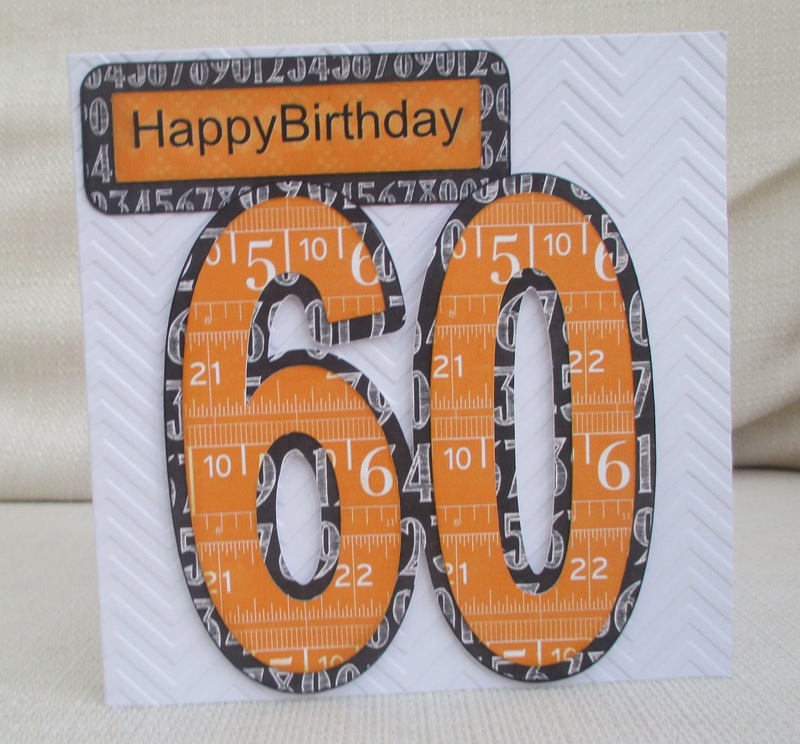 At the end of the month one of my male colleagues turns 60, and, as he's a maths teacher, I made this card for him. I hope we can count on you (haha) to join us at Make My Monday this week. 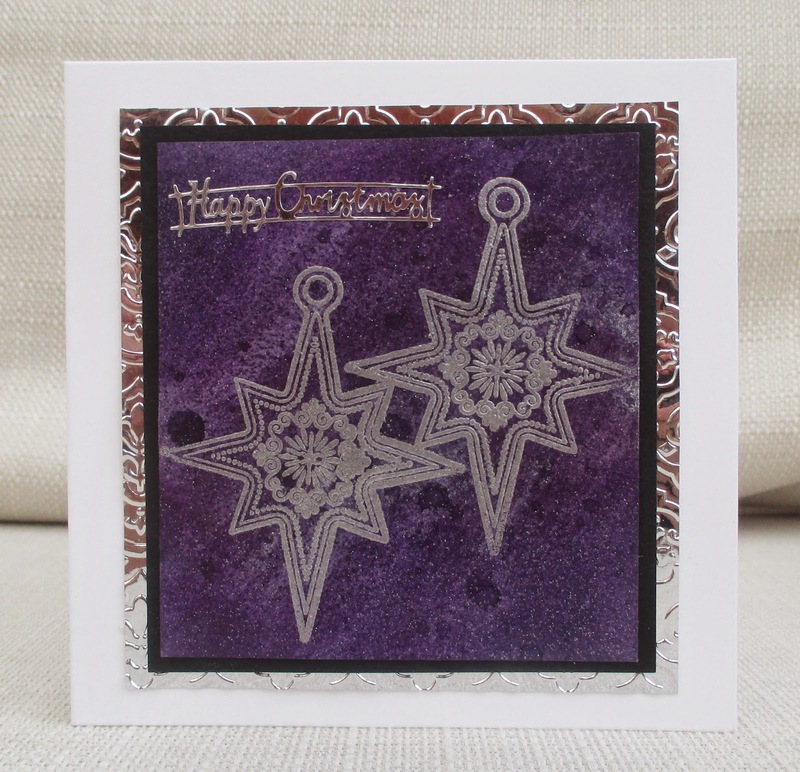 We have a colour challenge at Inkspirational - purple with grey or silver. 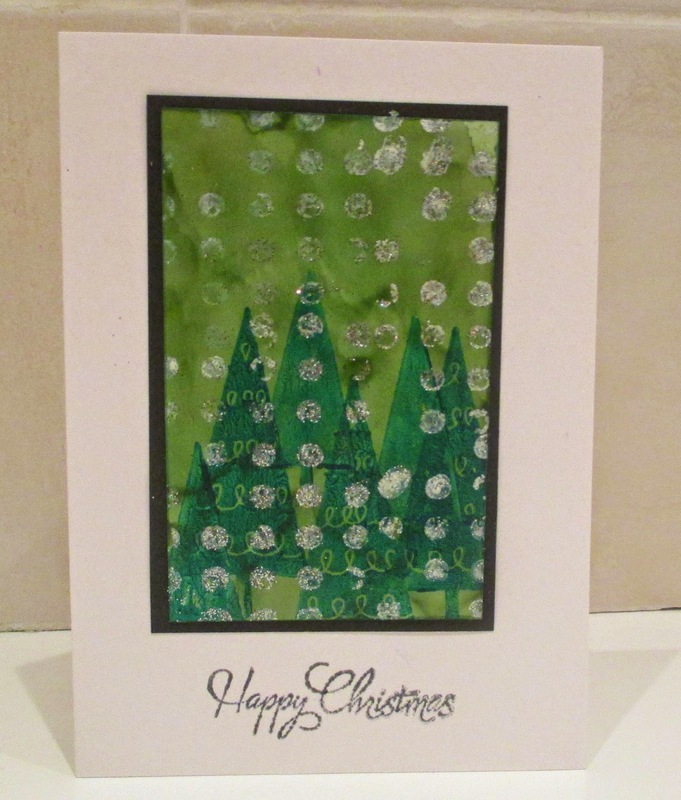 For my DT card I used a bauble stamp I got free with a magazine. I had to play around a lot to get the intensity of purple I wanted. I used several inks and some plum Twinkling H20s and I sprayed everything with water for mottled effect. Then I used silver embossing powder to emboss the stamped image. Finally, I sprayed it with glitter. This final one is the wrong colours for Inkspirational but I enjoyed doodling strings for the baubles and as a frame. We would love you to join us at Inkspirational with your purple and grey project. 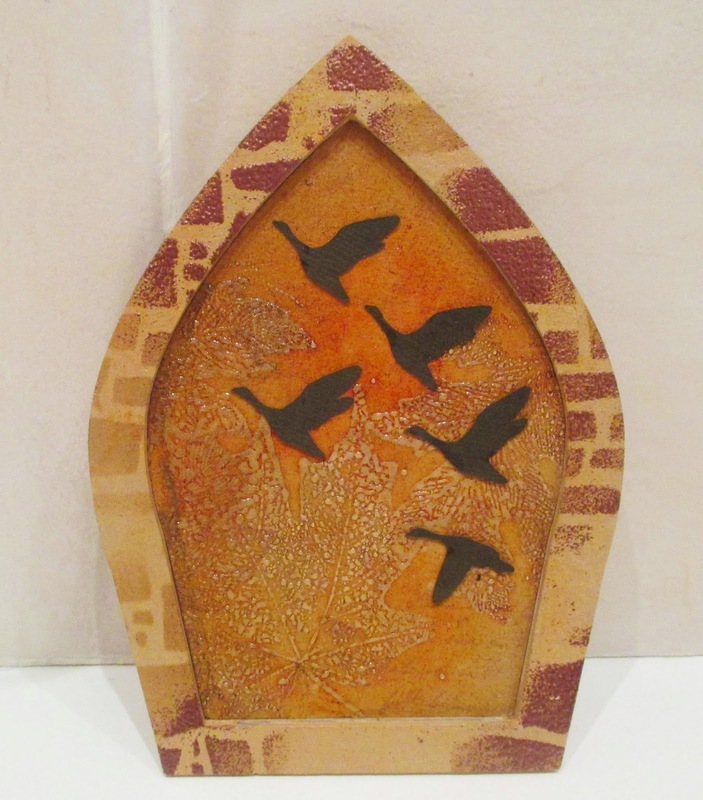 We have a wonderful guest designer, Lynda, so do come over and take a look. You may recognise the reindeer and papers as a recent freebie with a UK magazine (can't remember which). 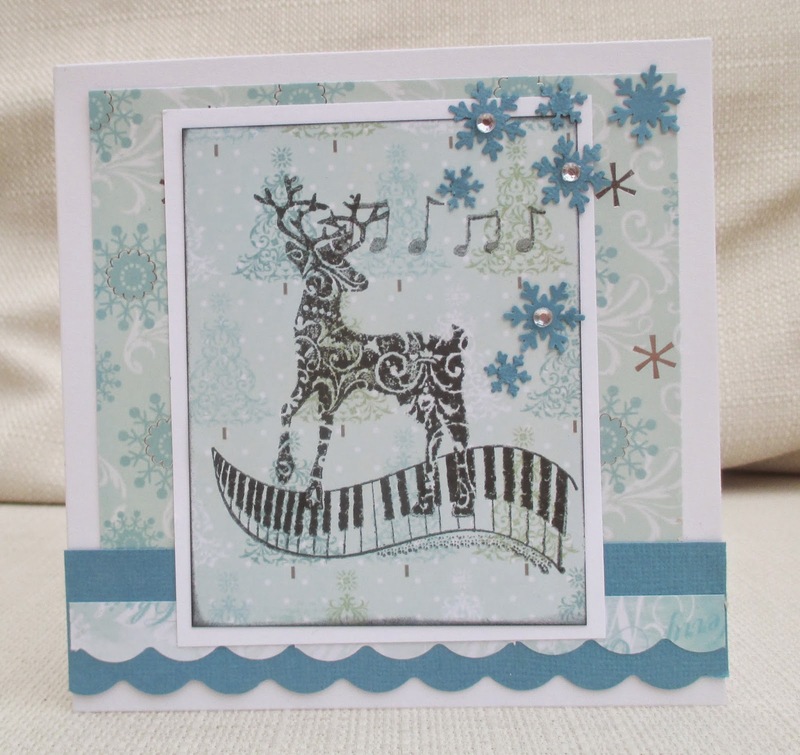 I masked the reindeer and added a keyboard and some musical notes - don't ask why- I just had them on my table and thought it would be nice! I added a border, punched snowflakes and stick on gems. When you get started on the autumnal cards, it's so hard to stop isn't it? Here, I melted copper embossing powder and pressed a Non Sequitur leaf/text stamp into it, For the background I use white embossing powder and various leaf stamps and inks. 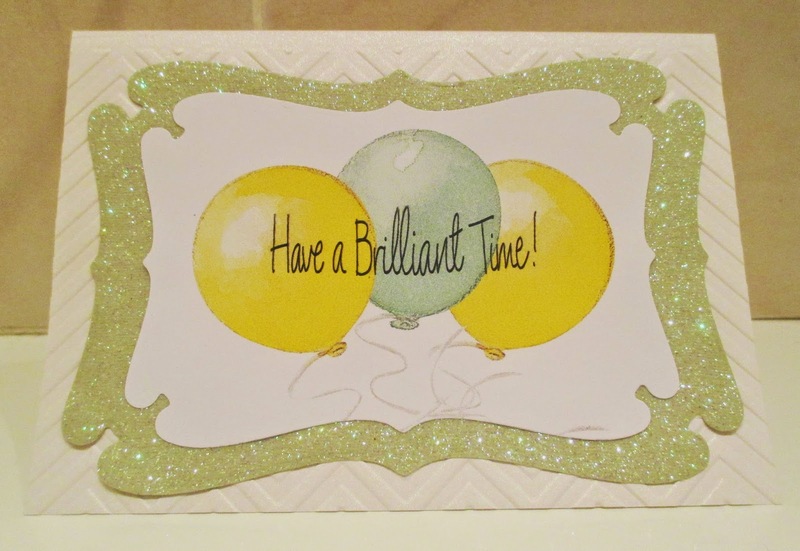 The final layer is crimped card sprayed with gold mist and I added twine, pearls, a brad and a stamped sentiment. One of my favourite sights and sounds of autumn is the migrating geese. Here I used a Tando chipboard arch and frames. I painted them and built up layers of paint, ink, gold misting spray and stamps (leaves and script) . Then I clear embossed the leaf stamps ( Hero and Stampin Up) and slapped more ink over the top for a subtle resist effect. The geese were cut out on the Silhouette electronic die-cutting machine. For the frame I used a brickwork stencil and randomly inked through it. Then I sprinkled parts of the inked areas with copper embossing powder. 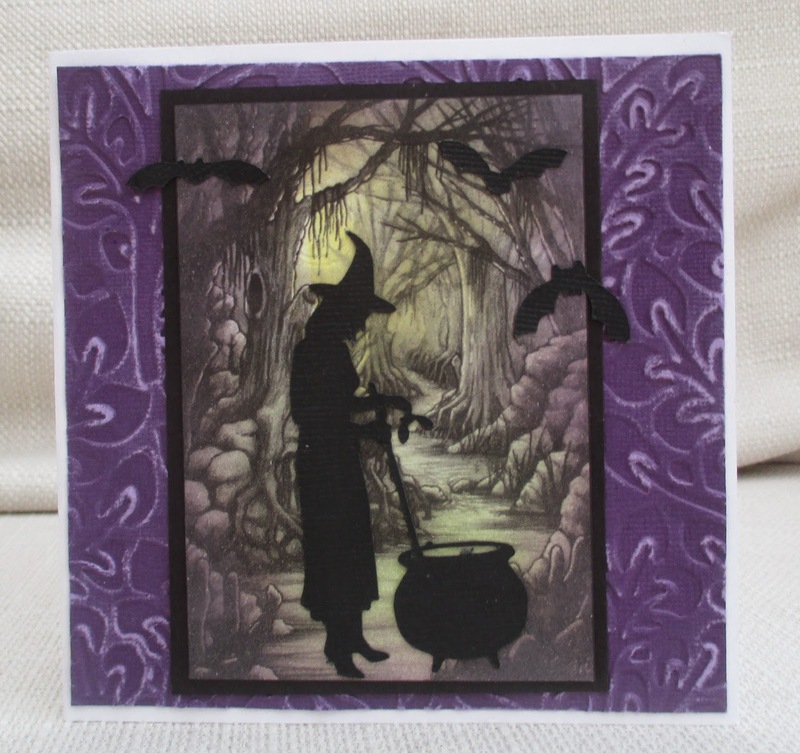 The new challenge at Creative Cutting Challenge is Halloween. 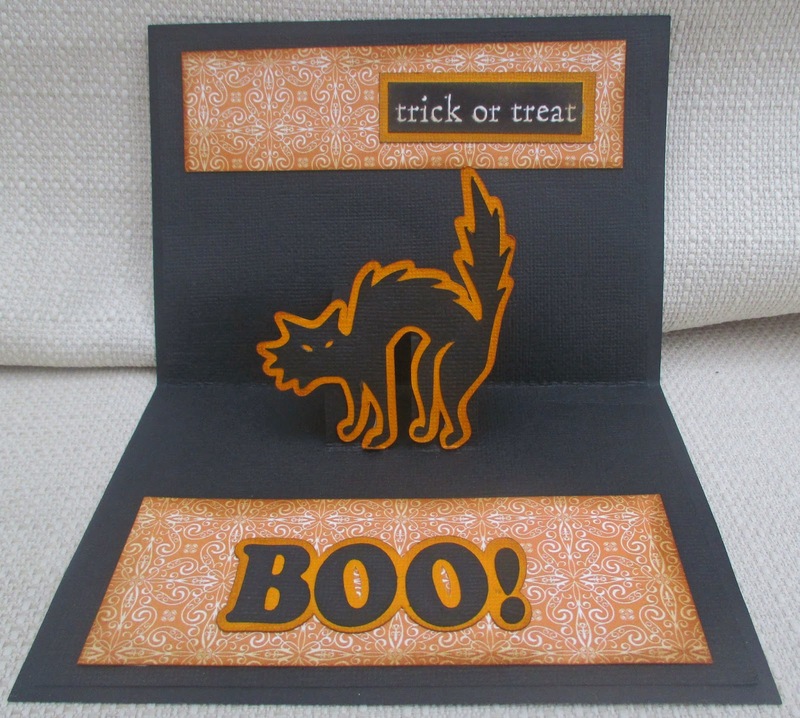 I made a pop up card using the cat from Halloween Set One from The Creative Pointe . 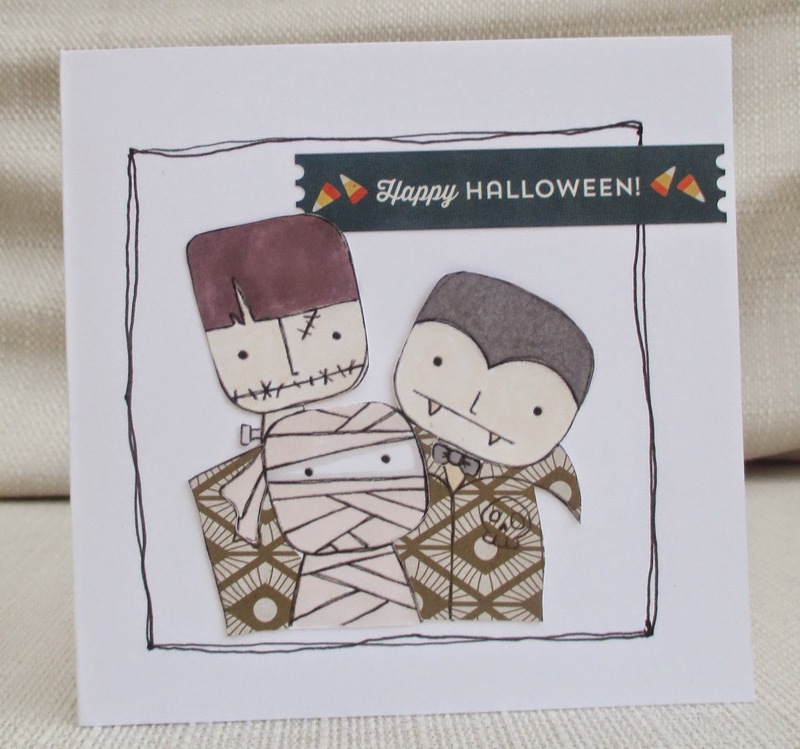 We'd love you to join our challenge at Creative Cutting - all you need to do is use an SVG or similar electronic cutting file, make a Halloween project and tell us what you've used. See you there. This week's challenge at Make My Monday is Children or Babies, and as you can see, I made a 'new baby' card. The image is cut from a piece of Graphic 45 paper and almost everything else is things I had lying about - die cut rose, heart and circle, a punched border, lots of pink ink, and pearls. I hope you will come and join in at Make My Monday . While I've still got the 'Nordic' paper out , I made this. Actually there are three papers from two different sets that were magazine freebies. I thought using the red panel would show up the paper piecing on the clothes better. The image is a digi by Heather Ellis. I set out to make a card for a man - but actually, I think it's turned out quite unisex. The balloons are from Forever Friends Celebrations CD- I made them into a bunch and laid the sentiment (same CD) over the top. I printed the image, die-cut it and layered it with some die-cut glitter paper. 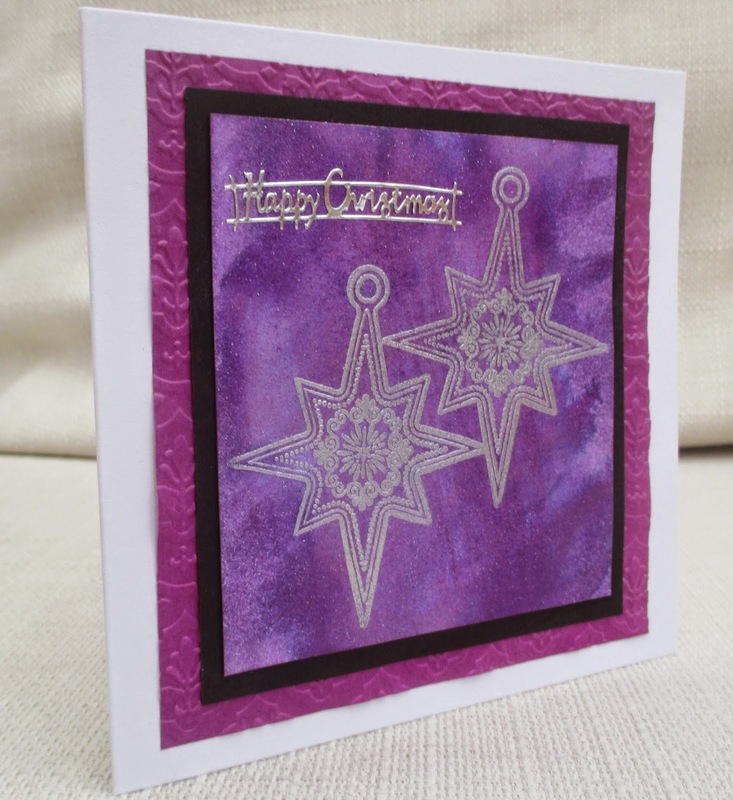 I embossed the base card with a chevron embossing folder. CD Sunday birthday card for a male.